Salvador Martinez aboard Toretto in the 11th trial Saturday afternoon at Ruidoso Downs. 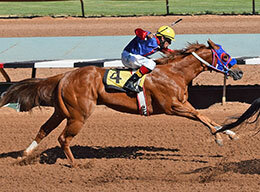 RUIDOSO DOWNS, NM�MAY 28, 2016�Toretto, a gelded son of Grade 1 second crop sire DOMINYUN, qualified for the $100,000-Guaranteed Ruidoso Juvenile Invitational at Ruidoso Downs today (Saturday). Ridden by jockey Salvador Martinez, the first-time starter finished second to $1 million Grade 1 Ruidoso Futurity finalist Jess Paint Ur Wagon in the 11th of 15 trials. The sorrel gelding completed the 350 yards in :17.911 seconds into a headwind, 10th fastest from 133 head who participated in 15 trial races. The first three trials enjoyed a tail-wind with half the top ten times coming out of those three trials. The horses with the second five-fastest times today (Saturday) will meet the horses with the second five-fastest times from Friday�s trials in the $100,000-Guaranteed Ruidoso Juvenile Invitational on June 12. AQHA Racing Champion trainer Paul Jones conditions Toretto for owner Paul Blanchard. Vista Equine Colorado, LLC bred the gelding in Colorado from the First Down Dash mare Le Mishka, a sister to champion sire Brookstone Bay. Toretto is a 2015 $27,000 Ruidoso Select Yearling Sale graduate. For the complete list of Ruidoso Juvenile Invitational finalists, their times, sires, dams, owners, breeders, trainers and jockeys CLICK HERE.